There are many causes of seizures. Idiopathic epilepsy, the most common cause of seizures in the dog, is an inherited disorder but its exact cause is unknown. Other causes include liver disease, kidney failure, brain tumours, brain trauma, or toxins. Seizures often occur at times of changing brain activity, such as during excitement or feeding, or as the dog is falling asleep or waking up. Affected dogs can appear completely normal between seizures. 1. The pre-ictal phase, or aura, is a period of altered behaviour in which the dog may hide, appear nervous, or seek out the owner. It may be restless, nervous, whining, shaking, or salivating. This may last a few seconds to a few hours. This period precedes the seizure activity, as if the dog senses that something is about to occur. 2. The ictal phase is the seizure itself and lasts from a few seconds to up to five minutes. During a seizure, the dog may lose consciousness or may just have a change in mental awareness ("absence" seizures or hallucinations such as snapping at invisible objects). If the dog experiences a grand mal, or full-blown seizure with loss of consciousness, all of the muscles of the body contract spastically and erratically. The dog usually falls over on its side and paddles its legs while seeming to be otherwise paralysed. The head will often be drawn backwards. Urination, defecation, and salivation may occur. If the seizure has not stopped within five minutes, the dog is said to be in status epilepticus or prolonged seizure. Status epilepticus is considered an immediate emergency and medical help should be sought. 3. During the post-ictal phase - the period immediately after the end of the seizure - there is confusion, disorientation, salivation, pacing, restlessness, or even temporary blindness. There is no direct correlation between the severity of the seizure and the duration of the post-ictal phase. Is a Seizure Painful or Dangerous for the Dog? Despite the dramatic and violent appearance of a seizure, they are not painful, although the dog may feel confusion and perhaps panic. Contrary to popular belief, dogs do not swallow their tongues during a seizure. If you put your fingers or an object into its mouth, you will not help your pet and you run a high risk of being bitten badly or of injuring your dog. The important thing is to keep the dog from falling or hurting itself by knocking objects onto itself. As long as it is on the floor or ground, there is little chance of harm occurring. A single seizure is rarely dangerous to the dog. However, if the dog has multiple seizures within a short period of time (cluster seizures), or if a seizure continues for longer than a few minutes, the body temperature begins to rise. If hyperthermia (elevated body temperature) develops secondary to a seizure, another set of problems may have to be addressed. What Happens when the Dog has a Seizure? Status epilepticus is a serious and life threatening situation. It is characterised by a seizure that lasts more than five minutes. Unless anticonvulsants are given immediately to stop the seizure activity, the dog may die or suffer irreversible brain damage. If status epilepticus occurs, you must seek treatment by a veterinarian immediately. Now that the Seizure is over, can I find out what happened? After a dog has a seizure episode, your vet will begin by taking a thorough history, concentrating on possible exposure to poisonous or hallucinogenic substances or any history of head trauma. The vet will also perform a physical examination, blood and urine tests and sometimes an ECG. These tests rule out disorders of the liver, kidneys, heart, electrolytes and blood sugar levels. If results are normal and there has been no exposure to poison or recent trauma, further diagnostics may be undertaken, depending on the severity and frequency of the seizures. An MRI of the brain is likely to look at the structure of the brain. Occasional seizures (less frequently than once a month) are of less concern, unless they become more frequent or more severe. In this instance, a spinal fluid analysis may be performed. Can Seizures be Treated or Prevented? 3. grand mal seizures that are severe or prolonged in duration. The two most commonly used medications to treat seizures in dogs are phenobarbital and potassium bromide. Research into the use of other anticonvulsants is ongoing, and combination therapy is often used for dogs that respond poorly to standard treatments. Once anticonvulsant medication is started, it must be given for life. There is evidence that, if anticonvulsant medication is started and then discontinued, the dog may have a greater risk of developing more severe seizures in the future. Even normal dogs without a history of seizures or epilepsy may be induced to seizure if placed on anticonvulsant medication and then abruptly withdrawn from it. If anticonvulsant medication must be discontinued or changed for some reason, your vet will give you specific instructions for doing this. Seizuring or epilepsy is known to occur in both Petits and Grands. The BGV Club works closely with the Animal Health Trust by ensuring cheek swabs are submitted from the small number of affected hounds and their family units. The AHT also collects swabs from older, unaffected hounds, with this well phenotyped control group known to be clear of the condition under investigation. Recent advances in DNA testing are hopefully moving research towards establishing the mode of inheritance and the genes responsible for those identified with epilepsy. posture, placing reflex and cranial nerves. These tests also eliminate other health problems and need to be sent to the AHT with responses to a questionnaire and a set of cheek swabs providing the dogs DNA. In the knowledge that seizuring affects many breeds of dog, the incidence of seizuring in the Basset Hound breed has not given great cause for concern, however it is known to occur. All breed clubs are committed to improving quality of life for Bassets and their owners by helping Bassets to live longer, healthier lives. They encourage a strong commitment to the reduction of genetic disorders in the breed and, should any health survey highlight an increase in seizuring, steps would be taken to establish the genes responsible and mode of inheritance. 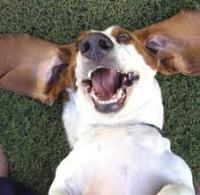 Lafora Disease is an inherited form of epilepsy seen in several breeds, including the Basset Hound. This disease is characterised by involuntary muscle contractions seen as rapid shuddering, which can be caused by an audio or light trigger, as well as spontaneous seizures. This can affect how the dog interacts with everyday tasks and usually clinical signs are exhibited from 6yrs old. This debilitating disease slowly progresses and can lead to loss of control of movement, blindness and dementia. As of early 2016, the Animal Heath Trust is very close to developing a DNA test for the mutation that causes Lafora Disease in Bassets; however they still have some final validation to complete prior to launching the test. For this, they are seeking a random subset of DNA samples from approximately 100 Bassets to test for the mutation. There will be no charge for the DNA test result and you, the owner, will be informed whether your dog is clear of the mutation, whether itis a carrier or whether it will develop Lafora Disease during its lifetime. Basset Hounds already tested that are clinically affected with Lafora Disease have two copies of the disease-causing mutation, however the age of onset is variable. If an owner decides to receive the result of the DNA test, the AHT asks for an annual update to tell them whether his/her dog has any clinical signs of Lafora, regardless of the DNA test result.